c.4000 BC Earliest settlements at present-day Jerusalem. of the First Jewish Temple. c.612 BC - 539 BC Part of Babylonian Empire. Aug 586 BC Kingdom of Judah and first Temple destroyed by the Babylonians. 539 BC - 332 BC Part of the Persian (Achaemenid) Empire. 332 BC - 301 BC Part of Macedonia (under Alexander "the Great" to 323 BC). 301 BC - 200 BC Part of the (Ptolemaic) Kingdom of Egypt. 200 BC - 110 BC Part of the Seleucid Empire. 167 BC - 160 BC Maccabees (Maqabim) revolt against Seleucid rule. 140 BC - 6 AD Capital of Kingdom of Judea (Roman client state from 63 BC). 63 BC - 17 Jan 395 AD Part of the Roman Empire. Second Temple is destroyed Aug 70). 131 Jerusalem renamed Aelia Capitolina. 17 Jan 395 Part of the Eastern Roman (Byzantine) Empire. Nehemiah Ben Hushiel Ben Ephraim Ben Yosef [d.617]). Apr 637 Muslim conquest (Dome of the Rock inaugurated 691). of Jerusalem 2 Oct 1187 [retaken 17 Mar 1229] and 4 Aug 1244). 1187 - 1229 Part of the Ayyubid Sultanate. 1244 - 1263 Part of the Ayyubid Sultanate. 1263 - 1516 Part of the Mameluke (Mamluk) Sultanate of Egypt. 24 Aug 1516 - 10 Dec 1917 Part of the Ottoman Empire. 1827 Ottoman administration creates mütasarrifiya of Jerusalem. Dec 1831 - Jan 1841 Egyptian occupation of Jerusalem. 10 Dec 1917 - 1 Jul 1920 British military occupation. 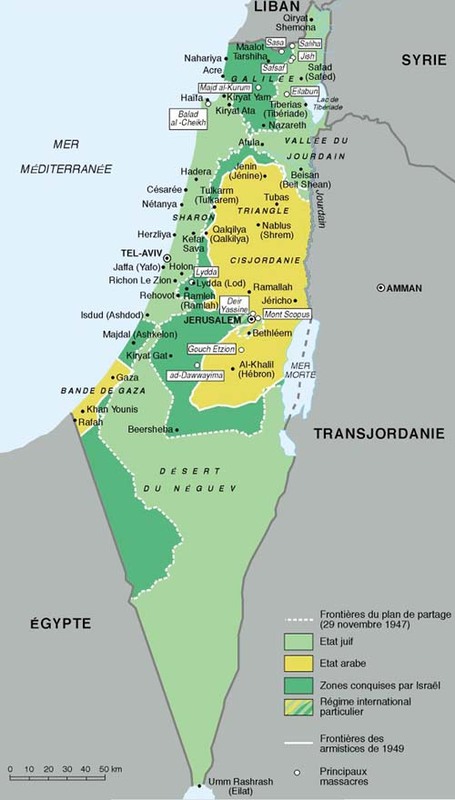 1 Jul 1920 - 14 May 1948 Part of British mandate of Palestine. administered by UN Trusteeship Council. 28 May 1948 Jewish Quarter in the Old City surrenders to Arab forces. 7 Oct 1948 - 5 Jun 1967 Cease-fire agreement creates a UN demilitarized No-Man's Land between Arab east Jerusalem and Israeli west Jerusalem. areas between them and two demilitarized zones. 13 Dec 1949 (West) Jerusalem proclaimed Israel's capital (enacted 23 Jan 1950). 24 Apr 1950 Jordan annexes East Jerusalem. 7 Jun 1967 Israel occupies East Jerusalem and the Old City. 28 Jun 1967 East Jerusalem is incorporated into the Israeli municipality of Jerusalem and the city limits are expanded. 30 Jul 1980 East Jerusalem is formally annexed by Israel. 29 May 1948 UNTSO created by UN Security Council. 5 - 6 Jun 1967 Jordanian forces occupy Government House. 5 Jun 1967 Israel occupies the Jerusalem Neutral Zone. clergy adhering to the Latin (Catholic) rite settled in the Levant. 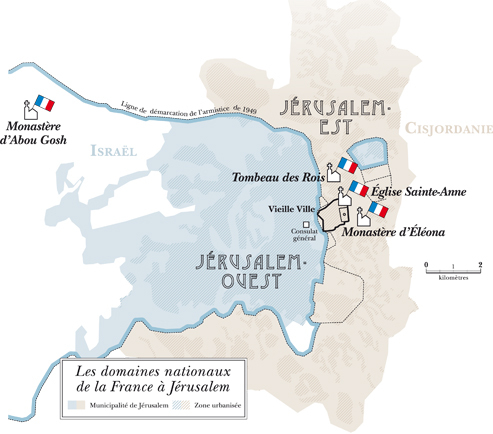 en Terre Sainte), National Domain of France in Holy Land. by Ottoman Sultan Abdülaziz I. The Monastery is founded in 1900.
above cave of teaching of Pater Noster), is donated to France. Holy Places" (ratified 28 Aug 1878). near the Damascus Gate, is donated to France. and religious freedom (announced 8 Sep 1914). Plácido de la Cierva y Lewit, conde de Ballobar (b. 1885 - d. 1971). effectively ending the French religious protectorate over "Latin"
Lausanne 24 Jul 1923, effective 6 Aug 1924). Jul 1940 - 28 May 1941 Consul-general loyal to "Vichy" France. 23 Jul 1941 - 1945 Consuls-general loyal to the Free French. ownership over various "national estates" in Jerusalem and Abu Gosh. recognizes it de jure 21 May 1949). institutions that depend on it in the Palestinian territories.